Introduction: On this page we discuss the possible uses of a toolkit like Clipper for working with online audio-visual resources. We start with an examination of the web annotation technology in general and then return to Clipper and how it might be used in diverse contexts, including; education & training, leisure, archives, and libraries. 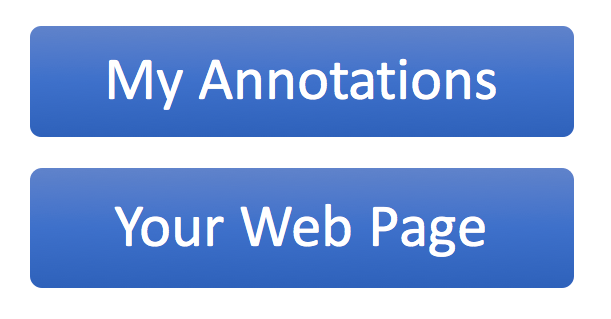 Web Annotation: Before we start discussing possible uses of Clipper, it is worth stepping back and considering the wider subject of web annotation technologies in general. The work of the W3C Web Annotation Working group is particularly useful to consider and below is a screen shot from an online interactive infographic that they have produced to illustrate how web annotations could work in practice. If you visit the link for this interactive infographic you will be able to step through the stages of creating content and annotating it and how users and publishers will interact together to create new services and opportunities based on this architecture. Innovation Platform: An outstanding feature of our experiences in our community consultation and design workshops is that the users come up with ideas we would never have imagined! In this section we describe and explore some of the possibilities we have discovered, we are sure there are many more. 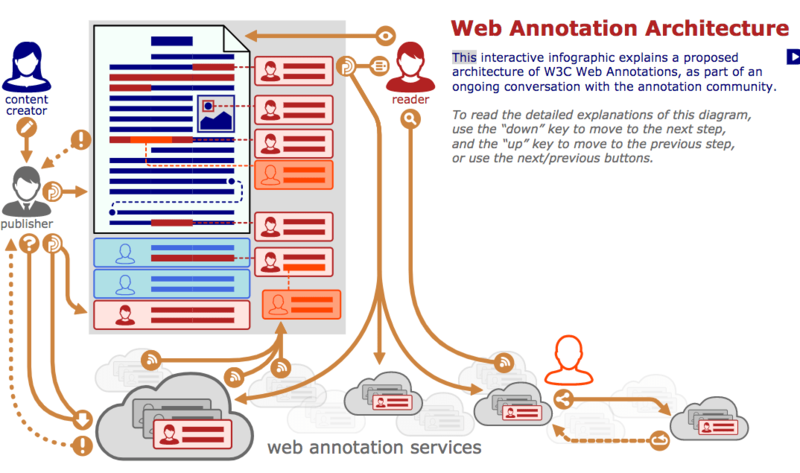 Here is part of the W3C diagram sequence representing the annotations linked to a web page – the annotations are in represented on the right hand side in their own separate annotation ‘web layer’ under the control of the reader. Below, we illustrate how these functions of Clipper can benefit both media owners and users in a range of different sectors and open the way to new innovative uses of online audio-visual media. The use of video and audio is becoming widespread in formal and informal education, annotation tools like Clipper open up new possibilities. Assessment – New innovative, more effective methods of assessment can be used. Not just to capture direct learner generated evidence of learning procedural skills, but to create clips from existing resources to ask questions and prompt analysis and discussions about the content, such as in terms of case-based learning (case studies) and testing of learner’s knowledge applied in real world contexts (e.g. fire control and surgery) to identify good and bad practice and likely outcomes etc. based on the content of the clip. Leisure: Being able to select, manage, find and share all your favourite bits of online video or audio would make life a whole lot easier and open new ways of interacting with this type of content for both content owners and users. One obvious example might be a local football club with its own online video channel. Fans, players and coaches could go online and select clips and create cliplists and share them with each other via social media and generate more interest and traffic to the club website. This in turn would open up new opportunities for the club and users to interact with each other – e.g. vote on the best goals / passes / defences / etc. of the season by sharing clips with annotations explaining their reasoning. This scenario has many parallels with the opportunities that exist for the heritage and cultural sectors – we discuss them next. Galleries, Libraries Archives & Museums: Often referred to as the ‘GLAM’ sector after the the abbreviation of the initials. Extensive collections of media resources have been digitised and made available through online collections, often paid for with public funds. However, finding, analysing, sharing and collaborating with these resources is still quite difficult. We think annotation tools like Clipper can help overcome these obstacles in order to promote public access and engagement with these types of collections to attract new audiences and develop exciting new forms of interaction with the content For the owners and managers of media collections, the creation and use of virtual clips from media collections, also provides a rich source of usage data that directly identifies popular media sources from within the collection, frequently clipped sections within those sources and their corresponding annotations and tags. When linked to social media channels (as in our football example above) this has the potential to greatly increase the online visitors to the collections – in ‘funding jargon’ this can be translated into greater public engagement in terms of reach and impact. The hook up with social media and generation of detailed user data can help justify the ongoing cost of maintaining these digital collections. The great thing about this approach is that the content stays where it is, under the control of the owners and collection managers, thus all the visitor traffic goes to the institutional site – bringing with it all the potential advantages. Data Analytics: This is worth a section on its own as it can drive so many other applications of annotation tools like Clipper, as we discussed in the ‘GLAM’ section above, it can generate much more granular data about what resources are being used by whom and what they are doing with them and who they are sharing them with – this goes way beyond just recording visitor numbers or book loans to a library or hits on a website. This is all part of the rapidly growing area of data analytics that the internet and digital technology are driving and enabling, which is having profound effects on our lives. The amount and detail of data that annotation systems like Clipper can generate is potentially very large indeed, especially if linked to large public collections with many users, a classic example of ‘big data’. In education for instance knowing which clips are being generated from existing media resources can tell us about those portions of the timeline that are of particular interest to users. In addition, what users are saying about those clips in their annotations and tags and who they are sharing them with gives us a much more (semantically) meaningful idea about what people are doing with these learning resources and can help us refine the resources and the design of the courses they are associated with. Academic Science and Arts Research: All the reasons for using Clipper previously discussed in this section apply to academic research. In fact Clipper started out in life as a project to explore and develop tools to help researchers manage digital audio-visual data. Two concrete example from our community consultations can help illustrate possible applications. 1) Anthropologists doing research ‘in the field’ interviewing people about their lives and cultures and work activites etc. generate a lot of material that needs to be painstakingly analysed and ‘marked up’ with comments and shared with other researchers – this is currently difficult and may need expensive closed software tools whose data cannot be easily shared. 2 ) Bio-science researchers using high definition video taken through scientific microscopes generate vast amounts of digital data that they need to collaborate with in international research groups. At the moment the data is often copied physically and transported around the world to facilitate collaboration – this is both time consuming and can lead to errors. Citizen Research: Closely related to the uses in the ‘GLAM’ sector describe above, citizen research (often referred to as citizen science) is a particularly good application for annotation technology. Having digitised large collections of media recordings and created basic cataloguing information about the resources the digital collections can sometimes languish underused in their own online ‘ghetto’ mirroring their previous existence in analogue archives. In our community consultations, we have encountered media archives who already have communities of enthusiasts who would create more detailed and descriptive records about the collections if it were made easier for them to do so. The British library has also been exploring this option as a way to deal with large data analysis problems such as the retro-conversion of printed card catalogues into electronic records using an online platform.